WARNING PROHIBITED ATTENTION REQUIRED, originally uploaded by The Bacher Family. 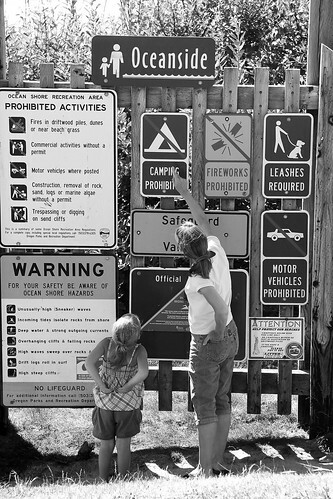 While visiting Oceanside in mid-August, I spotted this mother and daughter looking at the array of signs at the entrance to the beach. Something in their posture--specifically, the mirrored placement of their hands--captured my attention and my imagination, and I quickly snapped a photo before (inevitably) their position changed a moment later. I experimented with this one in color, but it just seemed too cluttered; black and white draws the focus to the human subjects better. Here's the same photo with a little less contrast. I think I like the higher contrast one featured here better.